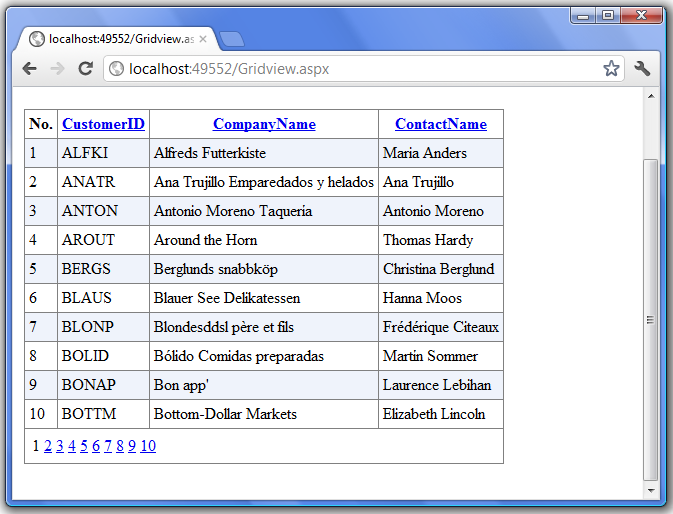 ASP.NET Gridview with custom paging and sorting. When displaying large amounts of data it's often best to only display a portion of the data, allowing the user to step through the data ten or so records at a time. Additionally, the end user's experience can be enhanced if they are able to sort the data by one of the columns. While default paging was easy to implement, it carried with it a performance cost since all records to be paged through were being returned from the database. That is, if the DataGrid was paging through a total of 1,000 records, showing 10 records per page, on each and every page request all 1,000 records would be returned from the database, but only the 10 appropriate ones would be displayed. Custom paging solved this performance issue by requiring the page developer to tell the DataGrid exactly how many total records were being paged through as well as returning the precise subset of records to display on the page. The following example use ObjectDataSource for DAL and Microsoft.Practices.EnterpriseLibrary.Data.dll (download here) to shorten code. Gridview with custom paging and sorting. How to write log using log4net in asp.net. The Apache log4net library is a tool to help the programmer output log statements to a variety of output targets. log4net is a port of the excellent Apache log4j™ framework to the Microsoft® .NET runtime. This article describes the easy way to be followed for using File Appender of Log4net to write to a text file in a web application day by day. First of all, get the latest version of log4net library and add reference of it in your project. You can download here : http://logging.apache.org/log4net/download_log4net.cgi. Add below line in your AssemblyInfo.cs file. Add below section in Web.Config file. Add one class Logging.cs file. //There are seven logging levels. //here cause error when it miss id querystring. That's it. Thank for reading. * Ideal for onetime initialization. * Optimization black magic; may run slightly earlier than pageLoad(). * Does not re-attach functionality to elements affected by partial postbacks. * Unsuitable for onetime initialization if used with UpdatePanels. * Slightly less optimized in some browsers, but consistent. * Perfect for re-attaching functionality to elements within UpdatePanels. * Useful for onetime initialization if only ASP.NET AJAX is available. * More work required to wire the event up. AJAX is the art of exchanging data with a server. AJAX allows web pages to be updated asynchronously by exchanging small amounts of data with the server behind the scenes and update parts of a web page, without reloading the whole page. Note : Classic web pages, (which do not use AJAX) must reload the entire page if the content should change. For every onxxx event available, like onclick, onchange, onsubmit, there is a jQuery equivalent. Some other events, like ready and hover, are provided as convenient methods for certain tasks. Here is CSS and script to put <head> tag. Add the following to <body> tags. One task you often face is to call methods on DOM elements that are not covered by jQuery. Think of a form you would like to reset after you submitted it successfully via AJAX. This would select all forms within your document, iterate over them and call reset() for each. Note that in an .each() function, this refers to the actual element. Also note that, since the reset() function belongs to the form element and not to the jQuery object, we cannot simply call $("form").reset() to reset all the forms on the page. This adds a background color to all anchor elements with a name attribute. For all hovered anchor elements, the parent paragraph is searched and a class "highlight" added and removed. Lets shop here. See you. jQuery provides two approaches to select elements. The first uses a combination of CSS and XPath selectors passed as a string to the jQuery constructor (eg. $("div > ul a")). The second uses several methods of the jQuery object. Both approaches can be combined. Let's start here. To try some of these selectors, we select and modify the first ordered list in our example. The example provides a stylesheet with a class "red" that simply adds a red background. Therefore, when you reload the page in your browser, you should see that the ordered list has a red background. I added some more classes to the child elements of this list as below. This selects all child lis of the element with the id orderedlist and adds the class "blue". There are many other selectors similar to CSS and XPath syntax. We start with an empty html page or .aspx page.This page just loads the .js library (make sure the URL points to where you stored your copy of jquery).As almost everything we do when using jQuery reads or manipulates the document object model (DOM), we need to make sure that we start adding events as soon as the DOM is ready. To do this, we register $(document).ready event for the document. Putting an alert into that function does not make much sense, as an alert does not require the DOM to be loaded. So lets try something a little more sophisticated: Show an alert when clicking a link. //otherwise, you can use built-in .js file while you use VS 2010. This should show the alert as soon as you click on the link. Let's have a look at what we are doing: $("a") is a jQuery selector, in this case, it selects all a elements. $ itself is an alias for the jQuery "class", therefore $() constructs a new jQuery object. The click() function we call next is a method of the jQuery object. It binds a click event to all selected elements (in this case, a single anchor element) and executes the provided function when the event occurs. The difference is quite obvious: We don't need to write an onclick for every single element. We have a clean separation of structure (HTML) and behavior (JS), just as we separate structure and presentation by using CSS. How to create silde down FAQs using jQuery. This example will show you how to use jQuery in order to generate easy-to-read and eye-pleasing FAQs, with a slide down effect. we are going to apply a “faq” class to the <dl> element so that it do not affect the other definition lists throughout the page. First of all we need to find and hide all the <dd> elements which are children of any <dl> element with the “faq” class. And then we need to add the toggle effect when a user clicks on a definition title so that when the user clicks on the <dt>, the script navigates the DOM to find the next element (which is going to be the relative <dd>), and it toggles it. You can set the motion’s speed to “slow”, “normal” or “fast”. Otherwise, you can use the following script reference. Here is CSS in <head> tag. check two times, as some of the validators do not support client side scripting. That's it what you have to do. Well done! How to solve "sys is undefined" error while using asp.net ajax update panel. We have the error "sys is undefined" often when we use asp.net ajax update panel in our ajax enable web site. The best remedy for this problem is to add the script to the ScriptManager’s Scripts collection and then call our wireups in a Sys.Application.init event handler. It is pretty good practice to separate .js file from source as much as we can. //delegate function to the init event. //provide a notification to users or to log errors. You can add client script to controls on an ASP.NET Web page declaratively, as you would to HTML elements (see recent post). Alternatively, you can also add client script events to an ASP.NET Web server control programmatically, which is useful if the event or the code relies on information that is available only at run time. In the page's Init or Load event, call the Add method of the control's Attributes collection. The following code example shows how to add client script to a TextBox control. The client script displays the length of the text in the TextBox control in other TextBox. You can add client script to controls on an ASP.NET Web page declaratively, as you would to HTML elements. In the control's markup, add an attribute for the event, for example, onmouseover or onkeyup. For the attribute's value, add the client script that you want to execute. The following code example shows an ASP.NET Web page that includes client script that changes the button text color when the user passes the pointer over it. <asp:Button ID="Button1" runat="server" Text="Button1" onmouseover="MakeRed(event);"
Postback is a concept introduced in ASP.NET and is a very handy method. Postback is built into the ASP.NET and .aspx web page support it without writing any statement. So, what you have to do just call this method with appropriate arguments. You can call this as shown below. However, it is not recommended to use this method name directly in the client side. The best approach is, generate this piece of code from the code behind file using ASP.NET. This way, you are safe even if Microsoft later change the name of the method '__doPostBack' to something else in a future release. 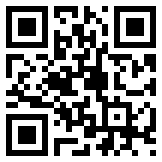 Now insert the following code in your .aspx page. To identify and handle the postback in code behind, you need a way to identify your postback in the code behind file. The second argument the doPostback method becomes helpful here. Whenever you press the Button, the page is loaded. To identify it is whether our postback or not, we used the second argument in the __doPostBack method to pass a value and used that in PageLoad to identify (here is "MyCustomArgument"). These days, MVC is more popular in enterprise web application environment, since it is easy to develop, flexible to manage and able to control over the rendered HTML for Rich Internet Application (RIA). So, we have to know much about MVC for our career as professional. If you are going to abroad like Singapore to find a job as .net programmer, you need to know MVC at all and it is 7 out of 10 times in interviews. Right now, you see how much it is important in IT industry. Let's start here. The Model-View-Controller (MVC) pattern is an architectural design principle that separates the components of a Web application. This separation gives you more control over the individual parts of the application, which lets you more easily develop, modify, and test them. ASP.NET MVC is part of the ASP.NET framework. 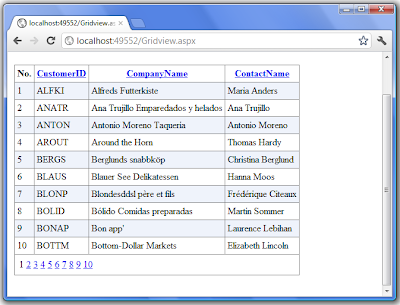 Developing an ASP.NET MVC application is an alternative to developing ASP.NET Web Forms pages; it does not replace the Web Forms model. The MVC framework is defined in the System.Web.Mvc namespace and is a fundamental, supported part of the System.Web namespace. 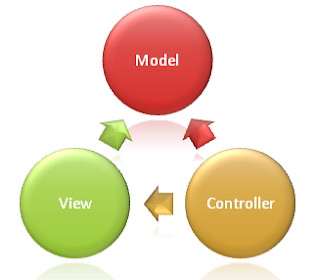 The MVC pattern helps you create applications that separate the different aspects of the application (input logic, business logic, and UI logic) with a loose coupling between these elements. The pattern specifies where each kind of logic should be located in the application. The UI logic belongs in the view. Input logic belongs in the controller. Business logic belongs in the model. This separation helps you manage complexity when you build an application, because it enables you to focus on one aspect of the implementation at a time. For example, you can focus on the view without depending on the business logic. For example, one developer can work on the view, a second developer can work on the controller logic, and a third developer can focus on the business logic in the model. Easier to manage complexity by dividing an application into the models. SEO and REST friendly URL (Search Engine Friendly). The following are the helpful resource. If an event is cancelable, you can use the preventDefault method and the returnValue property to cancel the event. When an event is canceled, the default action that belongs to the event will not be executed. For example, when the onclick event (the onclick event is cancelable) is canceled for a asp.net server control such as button, then clicking on the Button does not occur autopostback. The properties and methods mentioned above do not affect the propagation of events. If you need to prevent the propagation of an event in the DOM hierarchy or in asp.net ajax update panel or in page using master page, use the cancelBubble property and the stopPropagation method. When an event can bubble up, you can stop its propagation with the cancelBubble property or the stopPropagation method. Use the stopPropagation method in Firefox, Opera, Google Chrome and Safari, because the cancelBubble property is deprecated in those browsers. Internet Explorer also supports the stopPropagation method from version 9. In Internet Explorer before version 9, use the cancelBubble property, because the stopPropagation method is not supported. <asp:Button ID="btnDelete" runat="server" CommandArgument='<%# Eval("id") %>' CommandName="DeleteRow"
You can use implicitly typed local variables whenever you want the compiler to determine the type of a local variable. The var keyword instructs the compiler to infer the type of the variable from the expression on the right side of the initialization statement. The inferred type may be a built-in type, an anonymous type, a user-defined type, or a type defined in the .NET Framework class library. It is important to understand that the var keyword does not mean "variant" and does not indicate that the variable is loosely typed, or late-bound. It just means that the compiler determines and assigns the most appropriate type. * On local variables (variables declared at method scope) as shown in the previous example. * In a for initialization statement. * In a foreach initialization statement. * In a using statement. Recursion is an important programming technique. It is used to have a function call itself from within itself. One example is the calculation of factorials. The factorial of 0 is defined specifically to be 1. The factorials of larger numbers are calculated by multiplying 1 * 2 * ..., incrementing by 1 until you reach the number for which you are calculating the factorial. // If the number is not an integer, round it down. // If the number is less than 0, reject it. // If the number is 0, its factorial is 1. // Otherwise, call this recursive procedure again. I use here ASP.NET AJAX $get method to get the value of textbox and it is safe to use asp.netcontrol.ClientID for asp.net server control. I have to put ScriptManager since I used $get method. Moreover, make sure that it use innerText property for Label. Thank.